Was just there yesterday before I got my train from St Pancras back to Leicester. It’s open until 8pm and I did consider going in as I had some time to kill. Maybe we passed each other! You are an amazingly indefatigable researcher once you get a bone in your mouth. My hat will always be off to you. HAPPY 2ND ANNUAL HBD DAY!!!!!!!!!!!!!!! SPREAD THE WORD, MAY 2ND IS HBD DAY. Dear HBD Chick, In approvingly describing your work I recounted your testing of the theory and said to Mrs Dr Thompson “So the genes for violence were lost due to capital punishment, or transportation”. “What are the figures for Australia?” she said. 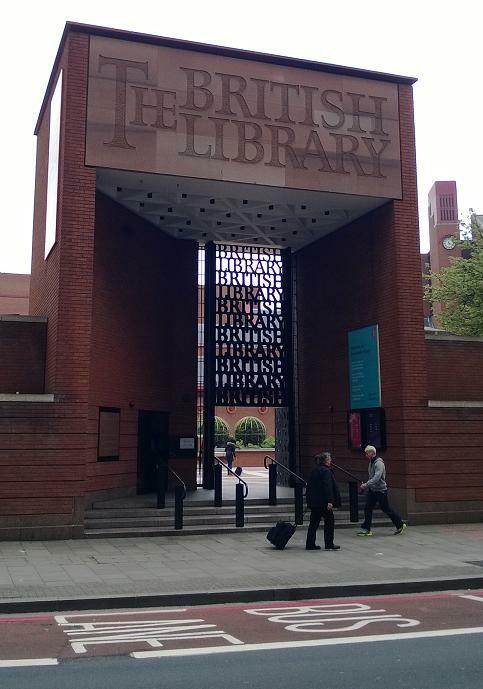 So, you will need to spend another week in The British Library. Best of luck with your researches. Peripheral areas, especially islands, tend to breed for strong criminality and powerful resistance to state authority. I’ve noticed this in myself and my mother’s family, most of whom were pirates. 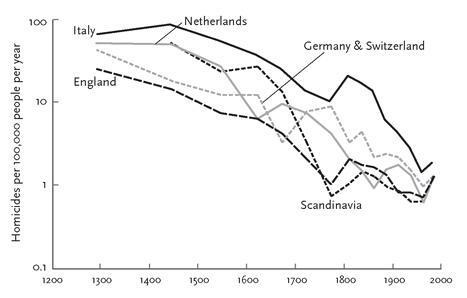 well, if you take a look at the chart from pinker/eisner (from previous post) which shows the decline in homicide rates in europe beginning in the 1300s, you’ll see that by far most of the decline happened in the medieval period, well before the transportations to australia — or even north america — happened. so i think we have to look to that period for the “pacification” of nw europeans and not so much the 1600s-1800s. if anything, there’s an interesting spike in homicide rates right around 1800 — whether that has to do with the increasing population or better records or something else altogether (or all of the above), i don’t know. so something less than 3% out of ca. 106,000 convicts were murderers. if we call it 1%, that’s just 1060 murderers transported to australia in a 65 year period (16 per year). and 20% of those were irish! so, no – the transportation of murderers out of england probably contributed very little to the pacification of the english. like i said above, that happened earlier in the middle ages. i think the increasing use of capital punishment (in some periods, the normans favored castration, btw — same or similar effect prolly) must’ve affected the average nature of the population. however, as i said in my previous post, historians of crime have a hard time explaining why homicide rates dropped so significantly in the medieval period in the netherlands where there *wasn’t* a strong state which could impose capital punishment on the population, while on the other hand in medieval northern italy where there *were* strong states meting out capital punishment, the homicide rates *didn’t* drop. something else must’ve been going on in the nw corner of europe. i’ll be posting more about this going forward, so…stay tuned! yes! that’s something i’d really like to see, too. kinda working on that in the background here — from an historical+genetics p.o.v. there *are* some data out there. For the Indian & Chinese diasporas, not just income data, but also at the very least ethnicity/language, state/province of origin, & educational info. Of course IQ and caste (for India) and clan affiliation (for Chinese) would be really nice but that’s just asking for manna from heaven. On the African diaspora in the New World I also want to compile at least income data, the language registers and the genetic data are probably the best we can do about specifying source regions in Africa. by the way if you can read Portuguese & French you wouldn’t believe the wealth of information out there about the African diaspora. Did you know there was a Muslim slave uprising in Bahia in 1835 ? “(ca. 1 convict in 5 was tried in ireland, most of them in dublin)”: it was notoriously difficult to get Irish juries to convict – those must have been very stupid, or very guilty, criminals.